When the power and pomp are gone: the afterlife of the world's dictators. In the preface to this short, gripping book, Riccardo Orizio quotes Ian McKellen, a man who has played many villains: "One of the few lessons I have learned from studying people who do terrible things is that they are all too human. And that we are all too capable of doing almost anything." Original sin is real. Evil is not an attribute of individuals, but of the species. It is intrinsic to consciousness. Human reason makes us angry with the failings of the world, but it also deludes us into thinking we can do something about those failings. And so, appalled as we may be by the actions of murderous dictators, we are also drawn to their simple rationalities - perhaps one more bloodletting really will open the gates to the Promised Land. The bloody dictator is an eternal human type and there will, eternally, be humans who fall for his charms. Orizio, the London correspondent for La Repubblica, has pursued seven of these vile charmers and this book is the record of those pursuits. He could not actually meet Enver Hoxha, the Albanian tyrant, and Slobodan Milosevic, because the first is dead, and the second imprisoned. But he meets their horrible wives and, in both cases, this turns out to be just as good. Nexhmije Hoxha ("the Black Widow") and Mira Milosevic should, between them, destroy forever the sentimental feminist illusion that a world run by women would be any better than one run by men. Orizio does not indulge in theory or psychology, he merely reports the meetings and the surrounding circumstances in the hope that "the exercise will help us to reach a greater understanding of ourselves". Not one of his subjects is repentant. Indeed, all see themselves as victims of circumstance. 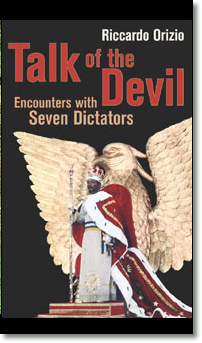 Mengistu's Red Terror in Ethiopia in the late 1970s left 500,000 dead. But, sitting comfortably in Harare, the old swine just shrugs. "It was a battle. All I did was fight it." The cold grip of General Jaruzelski on Poland is just the way it had to be - "Ask yourself what you would have done if you were in my shoes." Idi Amin, now safe in Jeddah, feels no remorse for the carnage he left behind in Uganda, "only nostalgia", and Baby Doc Duvalier knows voodoo justified the killers of the Tonton Macoute in Haiti just as that terrible religion will, one day, deify him. They all did what they had to do, the mass suffering was just a by-product. The consoling thought would be that they were all mad. There is, in some cases, plenty of evidence. Amin, who called himself "the last king of Scotland", was - and is - plainly an evil clown. Or there is the preposterous Jean-Bedel Bokassa, who insists that Pope Paul VI nominated him as the "13th apostle of the Holy Mother Church" and who solemnly announced to his subjects in the Central African Empire that he had awarded himself the title "Grand Master of the International Brotherhood of Knights Collectors of Postage Stamps". There are also less florid symptoms of simple, cold psychosis. The revolting Mrs Hoxha dismisses torture and murder as "trifles not worth mentioning". Jaruzelski delights in taking refuge in the necessity of history. Mrs Milosevic (she prefers to be called Professor Mira Markovic, so I'll stick to Mrs Milosevic) speaks of Serbian security and the war on terrorism to justify ethnic cleansing. She also calls her appalling son Marko "my poor, sweet puppy". By any recognisable standards, these people are, indeed, psychotics. For them, the feelings and sufferings of others simply do not exist. But madness is no real consolation. They all had plenty of followers to do their dirty work, followers who saw the derangement of their leaders as evidence of a higher sanity. Furthermore, you only have to look closely at the vicissitudes of daily life to see that their symptoms are not, in fact, that extreme. Petty Bokassas, Duvaliers and Jaruzelskis are to be found on every street and in every pub - it's only midday and I've encountered half a dozen already today. All that is different about the dictators is that some malign confluence of history and psychology gave them the chance to act out their villainous self-belief on a larger stage. Stepping back slightly, one can see some common themes in the circumstances that unleashed these monsters. The legacy of colonialism might be used to explain Duvalier, Bokassa and Amin, and the legacy of communism - another type of colonialism - could equally well explain Jaruzelski, Hoxha, Mengistu and Milosevic. In each case, a universal system and/or its aftermath allowed nations to be seduced by the barbaric simplifications of one man. The problem with that, of course, is that it leads to the obvious delusion that, once you get rid of the systems, then all will be well. This is plainly not so. Neither Robert Mugabe nor Kim Jong-Il can still seriously be categorised as post-colonial and post-communist psychos. And the emergence of Osama Bin Laden demonstrates that, when the state is no longer available as an instrument of evil, then something more elusive will be found to replace it. Evil, one way or another, will out. In the face of all this, Orizio, a fine professional, keeps his cool. His organisation of his material is subtle and his approach to his interviewees is earnest and straightforward. He lets them speak and, from time to time, he stands back aghast at how little they say. He seldom expresses his disgust, but it suffuses every line. This is very high-grade journalism indeed. He approached his subject using a journalistic ploy I know well. He said he was writing a book about forgotten individuals who had been blamed for the problems of their country. He rightly judged that this would hook them, apparently offering an opportunity for self-justification. But at least one refused - Panama's General Noriega. Orizio wittily reproduces Noriega's reply without comment on the last page. The general will not cooperate because "God, the great Creator of the universe, He who writes straight albeit with occasionally crooked lines, has not yet written the last word on MANUEL A NORIEGA". It is the perfect warning. The human future will be much like the human past. Why? Because we are human. 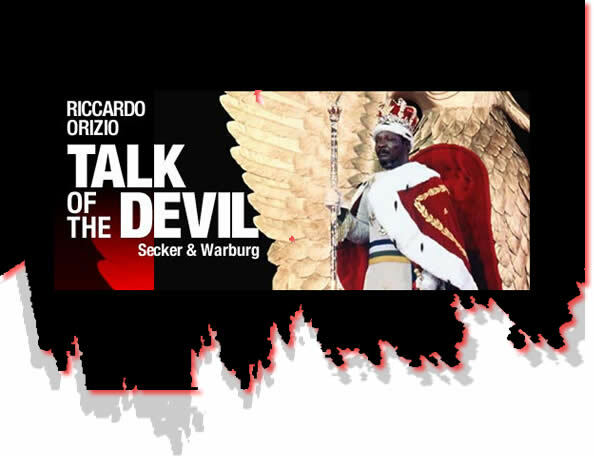 Se Pinochet è sempre potentissimo e Imelda Marcos è tornata a Manila e ha creato una collezione di scarpe griffate, Bokassa non c’è più ma la sua storia resta simile a quella di Amin: entrambi accusati di cannibalismo, entrambi convertiti all’Islam per far piacere al colonnello Gheddafi e ricevere i suoi petrodollari, entrambi scalzati dal potere nel ’79. Giudicare questi Diavoli si può? E’ possibile capire per esempio la Banalità del Male di una Milosevic, la moglie, la Strega Rossa, che dopo aver reso la Serbia un inferno col suo complice processato ora all’Aja, trascorre i pomeriggi a parlare al telefono con il marito detenuto cinguettando come in un disegno di Peynet: «Amorinoooo...»? Orizio ascolta le loro voci, perché «possiamo soltanto studiarli, i Diavoli». Sono storie da teatro tragico, tutte queste. E Ian McKellen, immenso attore che per 40 anni ha impersonato mostri di ogni epoca, da Jago a Rasputin, suggerisce l’approccio migliore: «Studiando coloro che compiono atti terribili, ho dedotto che anche loro sono umani. E che chiunque di noi è capace di tutto. O quasi».